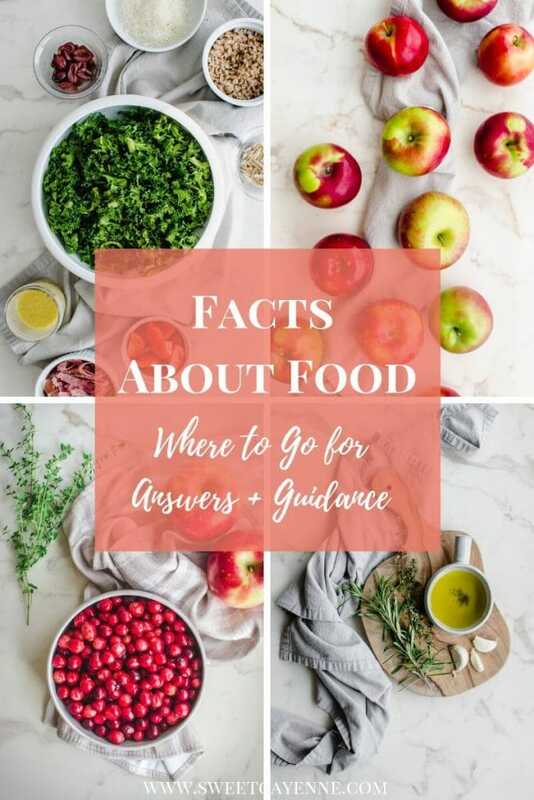 When it comes to finding and making the best homemade hamburger recipe, I’ve recently learned about a secret ingredient that results in the juiciest burgers EVER! Watch this video to see how I make these burgers! 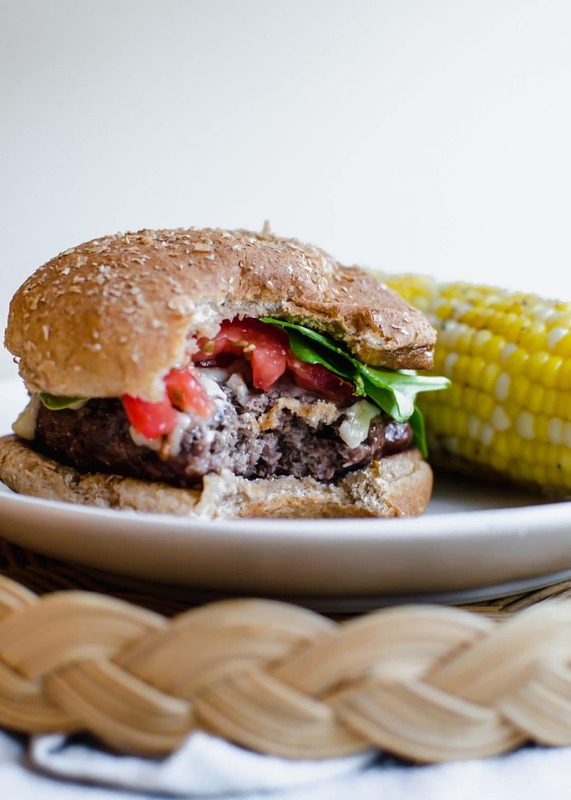 With the 4th of July being this week and the fact that lots of summer BBQs are still to come, I thought it was time I shared with you a life-altering tip I learned for making, literally, THE best burger I’ve ever made at home. 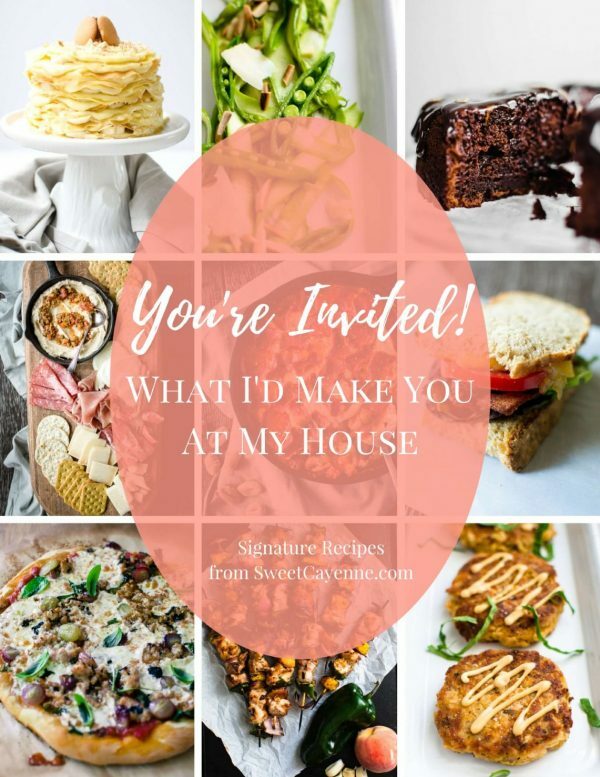 And if you utilize this particular secret ingredient and a few tried-and-true techniques, you will be on your way to making your own best homemade burgers – and hopefully getting creative with toppings and flavor combinations that I’m sure will be awesome! So for time’s sake (because we’ve got burgers to make! ), let’s just cut to the chase – the secret ingredient to the juiciest, most flavorful burgers is…….mushrooms! Finely diced mushrooms, that is. Ryan put me on to this when he came home from a conference having tried a burger from a cooking demonstration that was part of the Blended Burger Project. This campaign is part of a movement led by the James Beard Foundation (so you know it is legit!) to make burgers taste better, be healthier, and more sustainable by blending ground beef with chopped mushrooms. And I have to say, I’m ready to join the movement! The trick is to add 1/2 pound of chopped mushrooms to every pound of ground beef in your burger recipe. Doing this will result in incredibly juicy and flavorful burgers – and you won’t even realize the mushrooms are there! Really and truly! Adding the chopped mushrooms also has some budget benefit, as it increases the volume of your burger mixture and helps you stretch a pound of meat quite a bit further – I typically get 5 patties out of a pound of beef without the mushrooms and can easily get 7 patties when mushrooms are added. 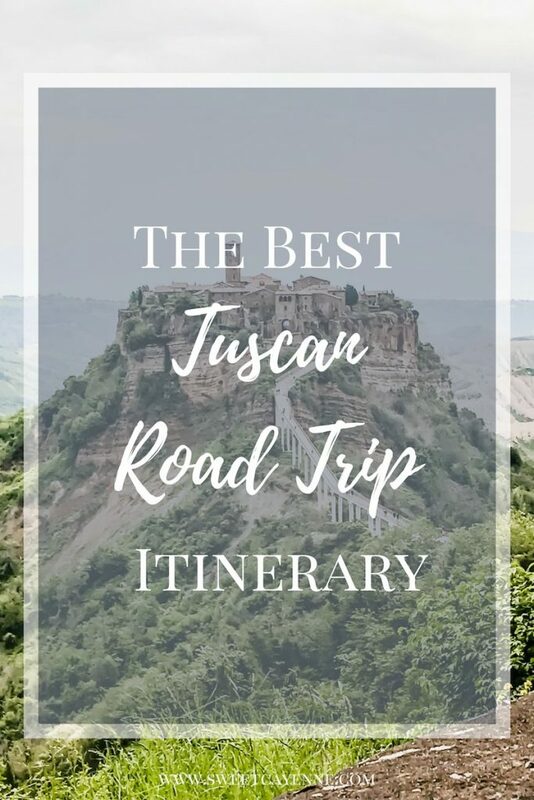 Need another reason to try it? 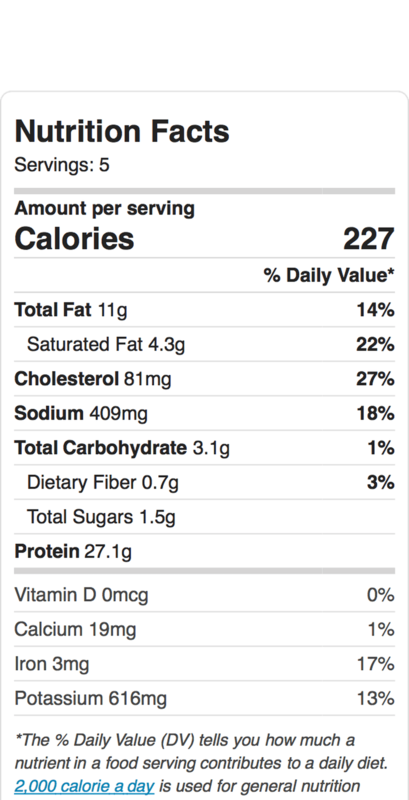 Nutrition would be a good one! 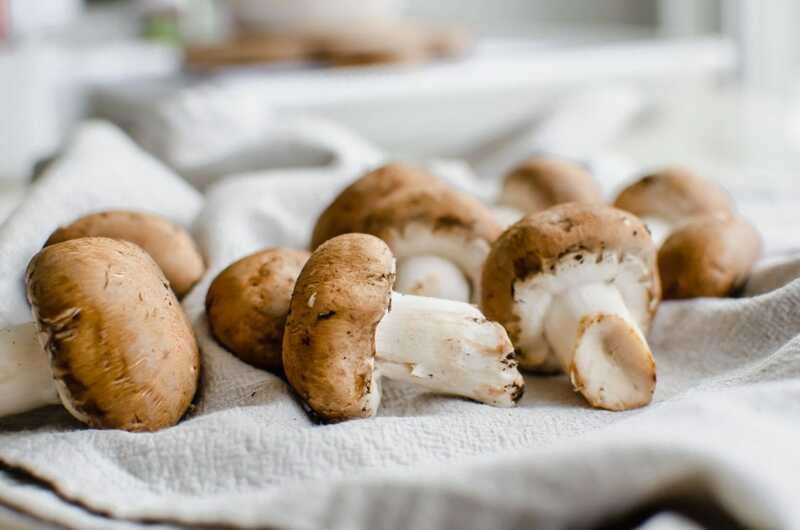 Mushrooms are high in several antioxidants – the most recognizable being selenium – as well as potassium, magnesium, zinc and folate! 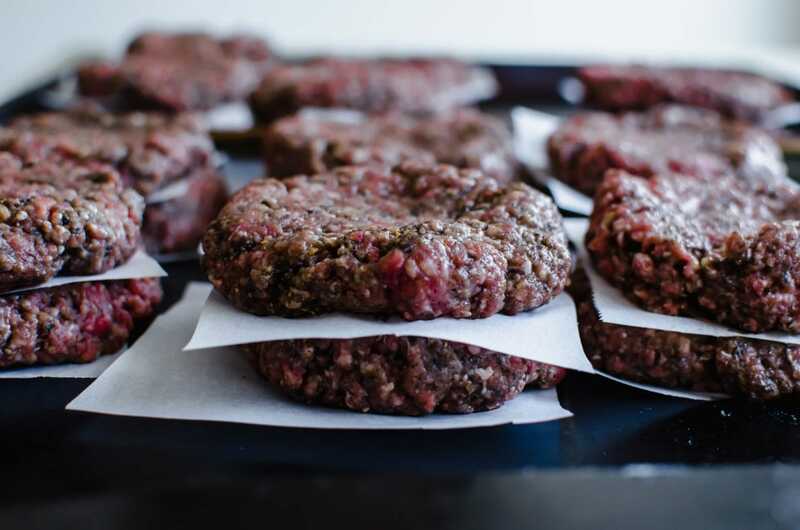 It’s ok to use lean ground beef – adding the chopped mushrooms will help your burgers retain flavor and moisture, so using a 90/10 ground beef or even 93/7 is A-OK. This is always what I buy and trust me, as someone who has tried many incredible 80/20 burgers, you will not miss the extra fat! Don’t overwork the meat – use a gentle hand and light touch when mixing the mushrooms/seasonings into ground beef and forming it into patties. Handling/pressing/squeezing the meat roughly will result in burgers that are tough and rubbery! You MUST use mushrooms – just an extra reminder! They will help keep the lean patties intact and prevent them from drying out as they are cooked. Let the grill do it’s thing – once you place your patties on the grill/stovetop, leave them alone until it’s time to flip. Pressing on the burgers with your spatula will not cause them to cook more evenly – it will only press out valuable juices! Make friends with a meat thermometer – taking the internal temperature of the thickest part of the burger patty is the gold standard, most reliable way to know when the burgers are cooked perfectly. I always prefer that my burgers be cooked to an internal temp of 155 degrees F, to ensure that harmful bacteria have been killed. The burgers are still incredibly juice at medium-well doneness when you have added the mushrooms! Make the fire with hardwood charcoal – typical charcoal briquettes may contain lighter fluid and other chemicals, which I feel may have a negative impact on the taste of the final product…and we just like to go the natural route whenever possible! Prepping the fire – know that it takes longer to get a kamado grill to the correct temperature that you need than with a typical charcoal or gas grill. 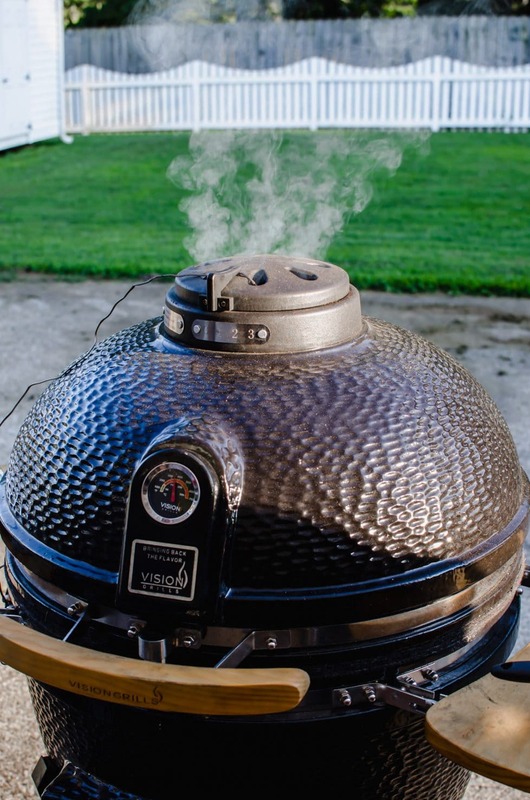 This is because kamado grills use vents for air flow to regulate temperature, so adjusting them as the grill heats is critical to maintain the desired temperature. Get a dual-prong thermometer – preferably with bluetooth capability! This will allow you to track the internal temperature of the grill from your phone throughout the heating and cooking process. The dual prong allows for taking the temperature of meats while you are cooking to check for desired doneness. You’ll want to position one prong just above the grill‘s surface to get an accurate temperature, then use the vents to make any necessary adjustments. The second prong is used to insert in the thickness part of the meat. Brush the burger patties with oil – do this when placing them on the grill and when flipping to keep them from sticking to the grill grates. Aim for 450-500 degrees F for the temperature range when coking burgers. Cook patties for roughly 7 minutes on the first side, apply oil, flip, then insert the other thermometer prong and cook for another 7 minutes or until the burger reaches 155 degrees F.
If you get a chance to try this secret ingredient for juicy burgers or any of the tips in this post, please let me know how it goes and leave a comment below! 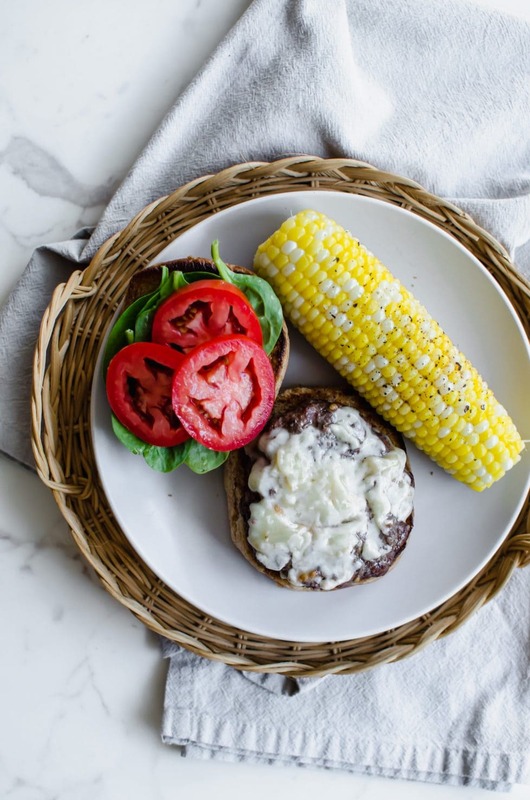 I’d also love to see your wonderful burger, so be sure upload a photo to Instagram or Twitter with the tag @sweetcayenne5 and hashtag #blendedburgerproject to be featured in my monthly newsletter! In the meantime, you may also enjoy taking a peek at my Blackberry Basil Burgers and Jalapeño Cream Cheese Sliders! 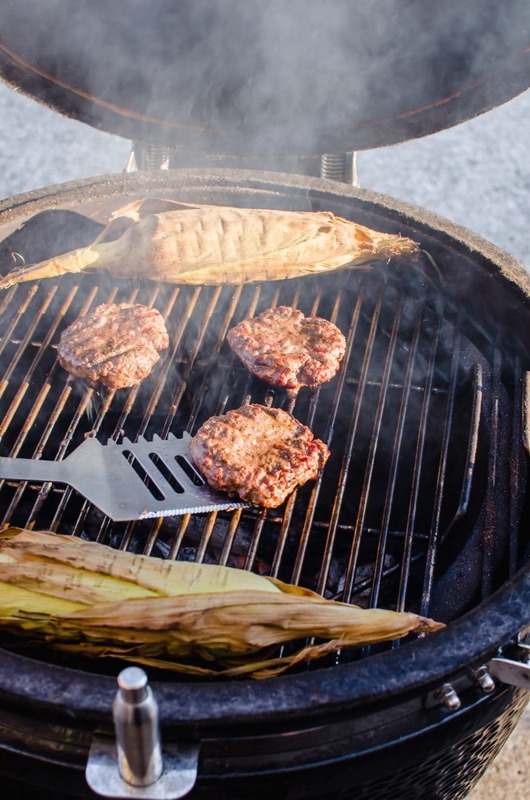 Below are the specific tools we use and recommend for great grilling! Keep in mind, a lot of these will go on sale as the summer ends. We bought our Vision Grill (kamado grill) on sale for 30% off during the month of October and got a killer deal! 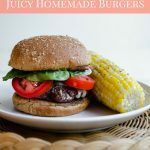 Learn the no-fail, secret ingredient for the BEST homemade hamburger recipe and all my tips for grilling burgers on a kamado grill! Finely chop the mushrooms, either by hand or in a food processor. Set aside. In a large bowl, whisk together the steak seasoning, Worcestershire, and soy sauce. Stir in the chopped mushrooms. Add the ground beef to the mushroom mixture and, using a light touch, gently incorporate the ingredients with your hands. Shape the beef mixture into 5-6 patties, depending on the desired size, and make the patties slightly thinner in the middle. Brush or spray oil on one side of the burger patties. Cook in a 450℉ kamado grill or over medium-high heat in a cast iron skillet for 6-7 minutes. Brush the patties with oil again prior to flipping. Cook an additional 6-7 minutes or until the internal temperature of the patties reaches 155℉. Remove from heat and transfer to a serving platter. Cover loosely with foil and let the burgers rest for about 5 minutes before topping and serving as desired. Previous Post: « Garden Journal: DIY Gardening on a Budget!